EuroNews, “the most watched news channel in Europe”, raised some eyebrows earlier when the following headline appeared on their website. 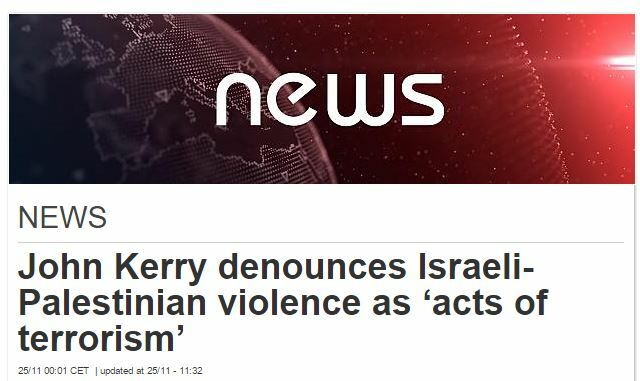 Echoing the headline, the opening passage of the article claimed that the US Secretary of State denounced the recent “spate of violence between Israelis and Palestinians” as “acts of terrorism” at a press conference in Jerusalem following a meeting with Israel’s prime minister. U.S. Secretary of State John Kerry on Tuesday described a wave of Palestinian knife and car-ramming attacks as terrorism that must be condemned as he held talks with Israeli and Palestinian leaders on how to end the violence. We’ve contacted editors and asked for a correction.